Not to be confused with Andorra national football team or Andorra CF. Most of the Andorra national football team are typically selected from FC Andorra, which currently competes in the Primera Catalana at the 5th level of the Spanish football league system. Although the club is based in Andorra, they have competed in the Spanish league system since 1948. Segunda División B, the third tier, is the highest league that the club have played in. Futbol Club Andorra has historically been the biggest football club in the country. The club was founded on 15 October 1942 in the College of Our Lady of Meritxell and was the first football club to be founded in Andorra. The club joined the categories of the Catalan Football Federation, contesting the Spanish League and Spanish Cup. After several years in regional categories, the Andorran club climbed in 1981 to Segunda División B (third level of the Spanish league system), where they remained for 17 years, with a break in the 1986–87 season when the team played in Tercera División. In the 1988–89 and 1989–90 seasons FC Andorra was close to promotion to Segunda División. The club's greatest success came in 1994 when FC Andorra won the Copa Catalunya. The Andorran team eliminated FC Barcelona in the semi-finals (aggregate 2–1) and defeated RCD Espanyol in the final played in the Municipal Stadium of Vilassar de Mar, winning 4-2 on penalties after no goals were scored during ordinary and extra time. At the end of the 1997–98 season the team was relegated to Tercera División (fourth tier). They are currently playing in Primera Catalana (the fifth tier of the Spanish football system). Their best performance to date in the Spanish Cup was in the 1995–96 edition, beating Palamós CF and Getafe CF before being eliminated by Celta Vigo in Round 16. From 1986 to 2013 the club also had a futsal section (FC Andorra Futsal) that played in División de Honor and División de Plata. FC Andorra was bought in December 2018 by Gerard Piqué's Kosmos Holding Group. 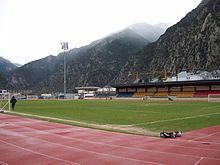 FC Andorra have historically hosted their matches at the Estadi Comunal d'Andorra la Vella in the capital city of Andorra la Vella. The club also hosted their home matches in the Camp d'Esports d'Aixovall (also named DEKV-Arena due to an sponsorship arrangement) located in the parish of Sant Julià de Lòria, with a capacity of 1,000 spectators. Since 2015, they play their games at reformed Camp de la Borda Mateu. The stadium has a capacity of 500. FC Andorra take the colours and icons of the country. The club crest represents the coat of arms of Andorra with some minor variations. Their first kit has been historically blue, yellow and red, the national colours of Andorra. Due to their colours the club have been nicknamed Els Tricolors (The Tricolours). This page was last edited on 14 April 2019, at 14:34 (UTC).